Children from poorer backgrounds in England are increasingly likely to miss out on learning a foreign language, suggests a report. Some teachers blame new tougher GCSEs for putting lower ability pupils off language learning. There is also a perception that languages are less important since the vote to leave the European Union, says the British Council study. 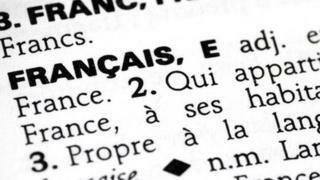 The government says its reforms are boosting modern languages in schools. The Language Trends Survey has published an annual report since 2002 when more than three-quarters of pupils (76%) took a modern language GCSE. By 2011, only 40% of pupils took a language at GCSE. The subject has recovered in recent years - in 2016 almost half of 16-year-olds took a language GCSE - but this figure fell to 47% last year. There has been a similar long-term decline at A-level. This year's report shows uptake of modern languages is disproportionately lower at state schools in more disadvantaged areas, with a widening gap between schools which are moving towards the government's ambition of 90% of pupils taking a language and others where languages are not a priority. It shows that schools with the highest proportions of pupils who are eligible for free school meals, a key measure of deprivation, are more than three times as likely as schools in the most affluent areas to have low uptake for language GCSEs and no plans to improve this. More than one-third of the schools surveyed said most students dropped languages by Year 9. Just over a third of state secondaries reported that leaving the EU was having a negative impact on language learning, with parents and pupils making comments like: "We don't need it" or "Everyone should speak English". But about 10% of schools were determined to boost language teaching post Brexit. "It is more important than ever for intercultural understanding and also for employment prospects for our pupils," said one senior teacher. Overall, independent schools have a higher take up of languages and more opportunities for international language exchange trips. But both state and private schools reported a concentration of higher ability pupils taking GCSE languages, with teachers blaming England's new tougher GCSE and A-level syllabuses for excluding lower ability pupils from the subject. Long-term trends suggest that Spanish is surging in popularity and is likely to overtake French as the main modern language taught in secondary schools, within a decade, says the report. Report author Teresa Tinsley said schools "struggling to overcome disadvantage and a growth in negative attitudes" needed "support and encouragement if all pupils across the board are to enjoy the enriching experience of learning a language". And Geoff Barton, general secretary of the secondary heads' union ASCL, said the government's approach to language learning was not working and offered to help ministers develop a new strategy. "There has seldom been a time when languages have been more important as these skills will be vital for international trade and politics in the post-Brexit era," said Mr Barton. School Standards Minister Nick Gibb pointed out the recent increase in the uptake of language GCSEs, with rising numbers of disadvantaged pupils studying core academic subjects. "It is critical that teachers encourage all pupils to take up a language and we are supporting this through the creation of expert schools that will share best practice across the country," he added. Teachers at 692 primaries and 785 secondary schools in England responded to the survey between January and March 2018.